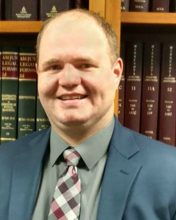 Derrick M. Greiner, attorney, received his law degree from William Mitchell College of Law in 2015, after graduating from Winona State University and Minnesota State University – Mankato with a B.S. in Teaching – Business Education in 2011. Derrick was born and raised on a farm outside Truman, Minnesota, for eight years before moving to Truman. In 2015, he moved back to his hometown area while working as a Law Clerk for two years for Judge Douglas Richards in Faribault County, and is now living in Fairmont. His practice areas include tax, real estate, estate planning and administration, ag law, and business law.